Grand Emperor Redsmith ruled with fear caused by the use of airships to patrol the colonies from above. No one was safe from his scrutiny... As sure as a soldier's pay is a sixpence a day, imperial scrutiny leads to mutiny. Rogue alchemists designed the Retro Rebel skycraft to take down the dreaded airships and fight the airborne tyranny. 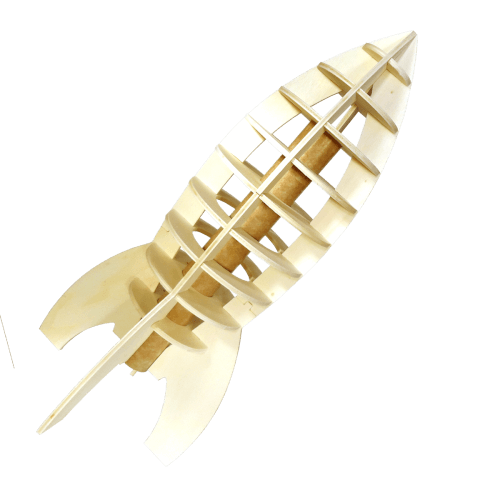 The Rebel Rebel rocket kit has eighteen pre-cut plywood pieces. The Kevlar heat shield is included. The Retro Rebel model rocket recovers with a parachute, ready for the next flight. Painting the rocket may cause it to exceed the maximum lift-off weight for black powder motors. This is not the case for composite rocket motors.